A benefit concert to support the American Heart Association. 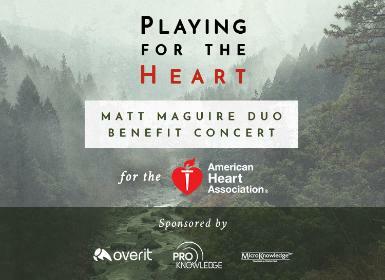 "Join the Matt Maguire Duo for a Benefit Concert in support of the American Heart Association’s Go Red for Women. Matt Maguire is a local pianist, singer/songwriter from Waterford, New York. With moving melodies, lush harmonies and instrumentation coupled with a unique writing style, Matt brings a fresh sound to adult contemporary pop music and is a stand out up and coming artist. Enjoy great music and support an exceptional cause at this one-night only event." Purchase your ticket now for $25. Starting May 4th tickets will be $35.